As some of you know, I spent a few days in Canada/Buffalo a couple weeks ago and had pretty good luck finding an awesome health food store (Bamboo) and vegan PODs from Pizza Plant, but the airports themselves were a bit more difficult. Luckily, I was able to find food in both the Buffalo and Chicago airports. 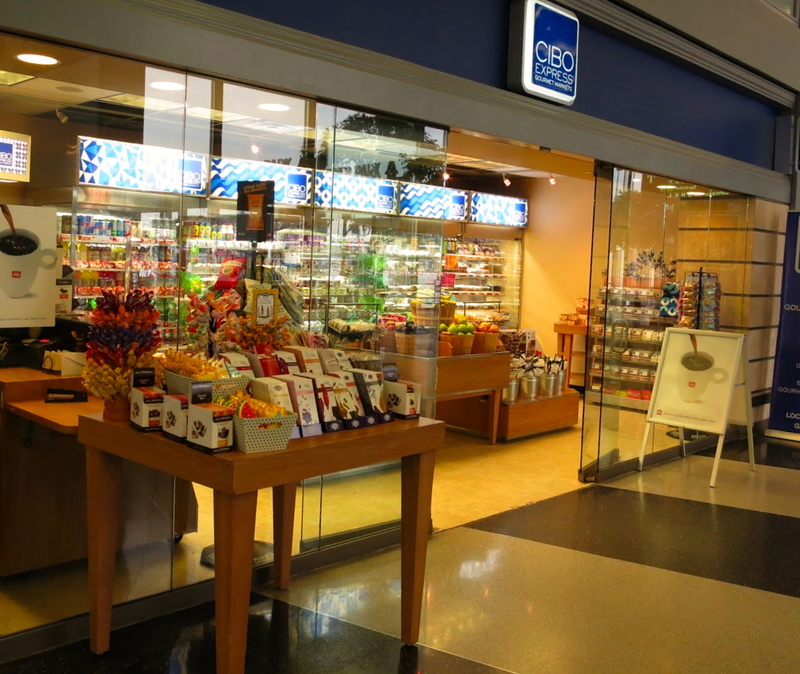 I did my research before leaving on the trip and saw that there was a place in the Chicago airport called Cibo Express that had vegan prepared food items, but on our layover on the way out I couldn’t find it and we didn’t have a lot of time. Needless to say we were pretty hungry and grumpy by the time we reached Buffalo around midnight and had to go to bed on an empty stomach. On the way back I was determined to hunt down Cibo during our layover to get us through the 4 hour flight from Chicago to San Diego. I knew BUF wasn’t going to be much help as far as food was concerned, but I did actually find some hummus and crackers at a little stand in the terminal. 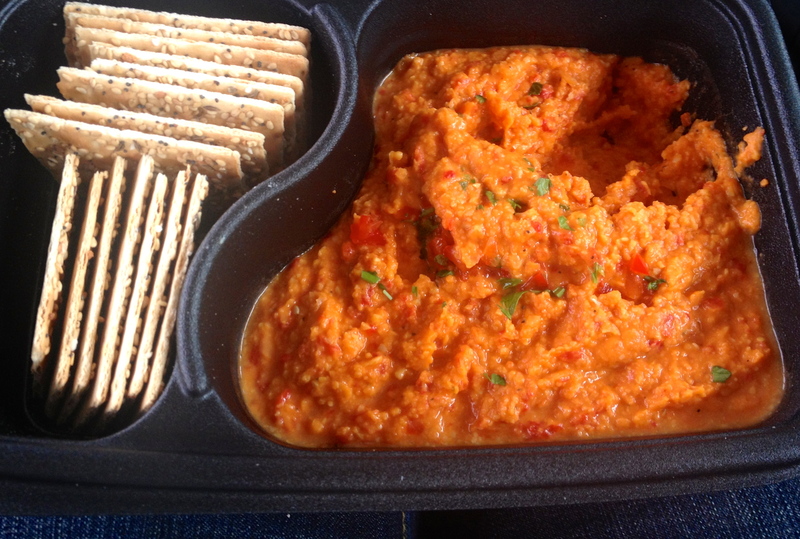 Certainly not the best hummus I’ve ever had (it was a little tasteless) but it was a decent tool to keep away my inevitable case of hangry until I made it to Cibo. The short flight from BUF to ORD was doubled when we landed and ended up sitting on the tarmac for 45 minutes and all I could think about was getting to Cibo and eating some real food. My stomach was audibly loud at this point. When we finally made it to the terminal I was irrational and irritated and walked up and down terminal C three times looking for this elusive vegan mecca of airport food before finding an employee and asking them. Terminal 2. Finally I had some direction. I made a beeline for the refrigerated vegan section and grabbed basically one of everything that said vegan on it (except for the Mac & Cheese – something about eating that cold grossed me out). $40 later I walked out of there with enough food to get the husband and I through the rest of our trip and then some. I started with the Buffalo Tofu. 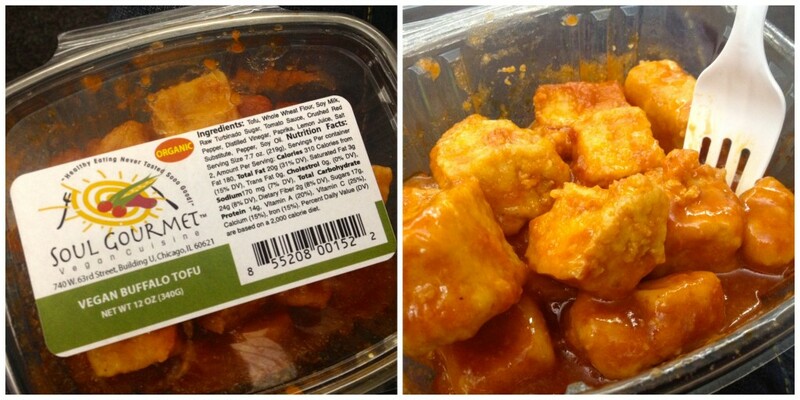 Large chunks of tofu smothered in spicy Buffalo sauce. The tofu appeared to be fried and was a little on the chewy side and the sauce was tasty though I would have liked it a little bit on the spicier side. I think this would be much better warm and served over rice or quinoa, but for my level of hungry it was awesome at the time. 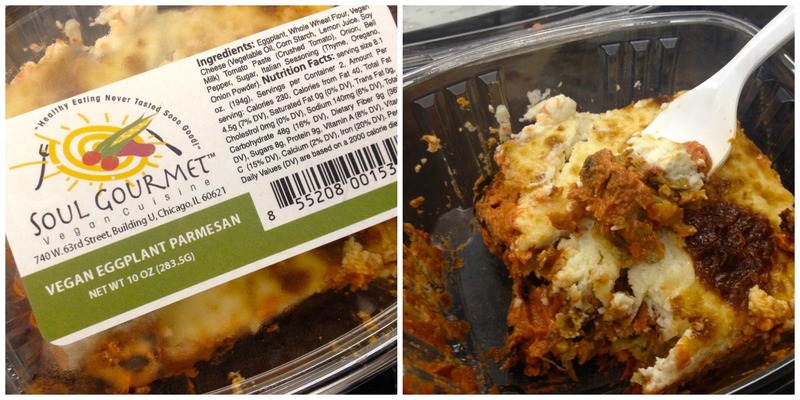 Next I tore into the Eggplant Parmesan. This was probably my favorite of all the dishes. It was flavorful and comforting, even though it was cold as well (hey Cibo, maybe invest in a customer microwave or something?). Thick layers of eggplant layered with tangy tomato sauce and a prety good vegan cheese. I didn’t really want to share this one with the husband, but I did, cuz I’m a good wife. Plus I knew it would make the rest our our journey pleasant as well. 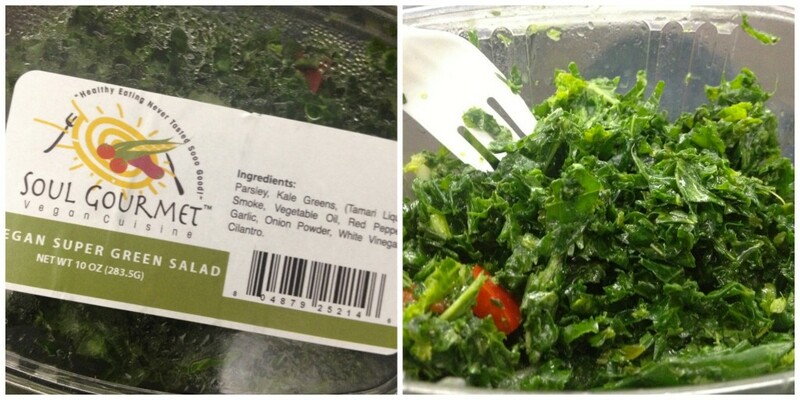 Last I opted for the Super Green Salad with kale, parsley, red pepper and spices. I knew I needed some greens for added nutrition but this was just meh. 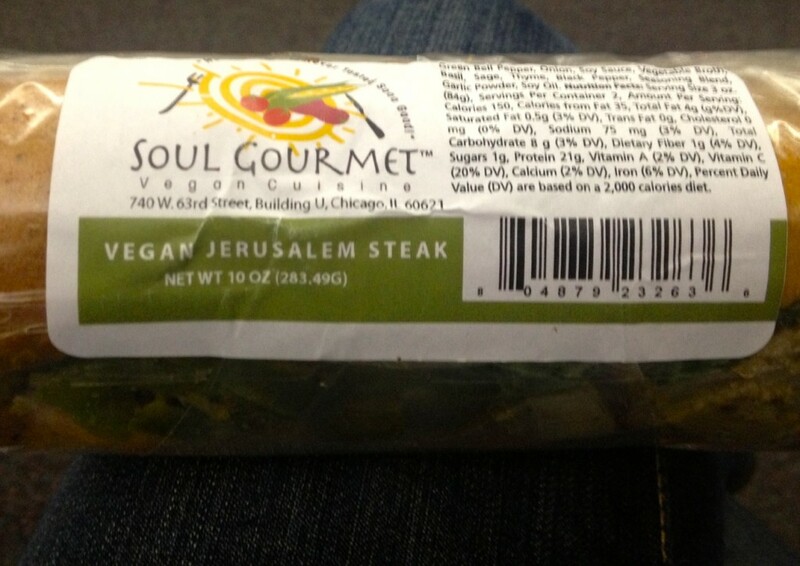 The only flavor I tasted was the parsley which was overpowering. I made it through half of it though for the sake of my health – gotta get your greens y’all! I purchased this sandwich as well but by the time I got through all of the above I was pretty darn stuffed so I saved it for the plane ride. I didn’t get hungry again so I put it in my mom’s fridge when we got back and then forgot about it when we left for home the next morning. So I can’t really vouch for this one. I’m sure my stepdad ate it. He’ll eat anything you put in his path. How was it Craig?? All in all I was just happy to be able to eat. Probably not the best vegan food in the world (not even close, in all honesty) but it was food and it was edible. Some of it pretty tasty. You can find Cibo in Terminal 2 (and I’m told there is one in Terminal 3 as well) of Chicago International Airport. It’ll get you through the hungries for sure.